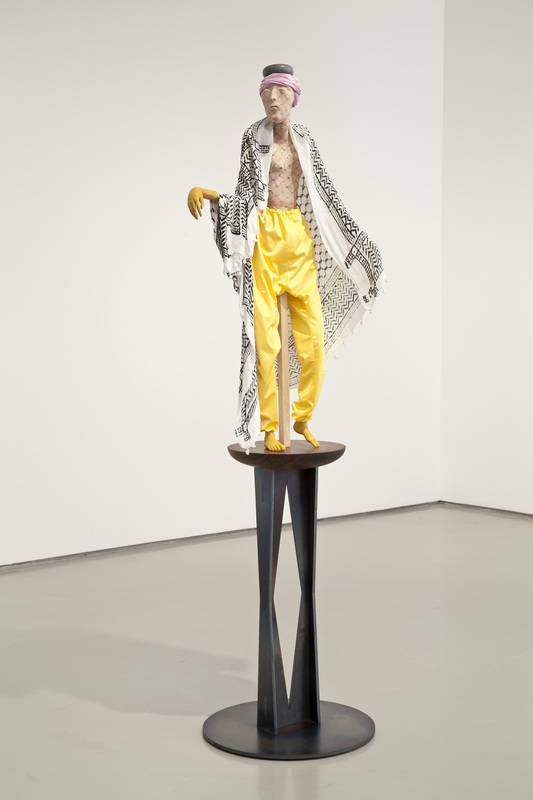 Born in New Plymouth, New Zealand and based in London, Francis Upritchard creates sculptural installations featuring archetypal figures—the psychic, the African, the nincompoop—hovering in a state of uncertainty. Modeled in polymer clay, the curious figures are rendered in a slightly unnerving scale, not quite human but large enough to look you in the eye with their only partially opened eyes and blank stares. The skin is painted monochromatically or with distinct gridded patterns, the tones ranging from sickly yellow to mossy green to calming blue, as if from an otherworldly tribe. 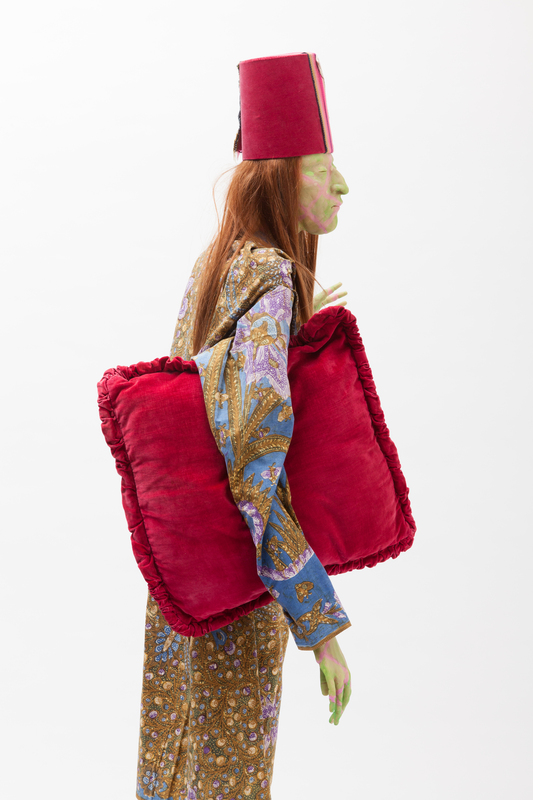 Yet their handmade and hand-dyed garb suggest they might be characters from a range of past eras, from medieval knights and jesters to meditating hippies in the 1960s. 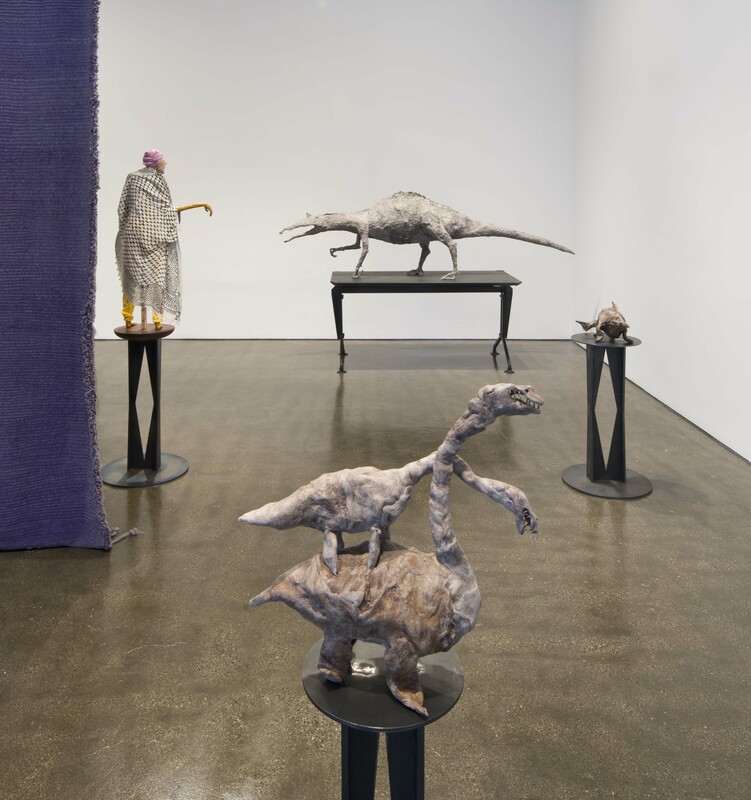 For a recent exhibition at Whitechapel Gallery in London, Upritchard experimented with both form and material, creating a group of dinosaurs out of papier-mâché or an earthy matter drawn from rubber trees in Brazil called balata and displaying them on simple yet elegant fold-out tables produced by the Italian company Olivetti on customized steel bases. 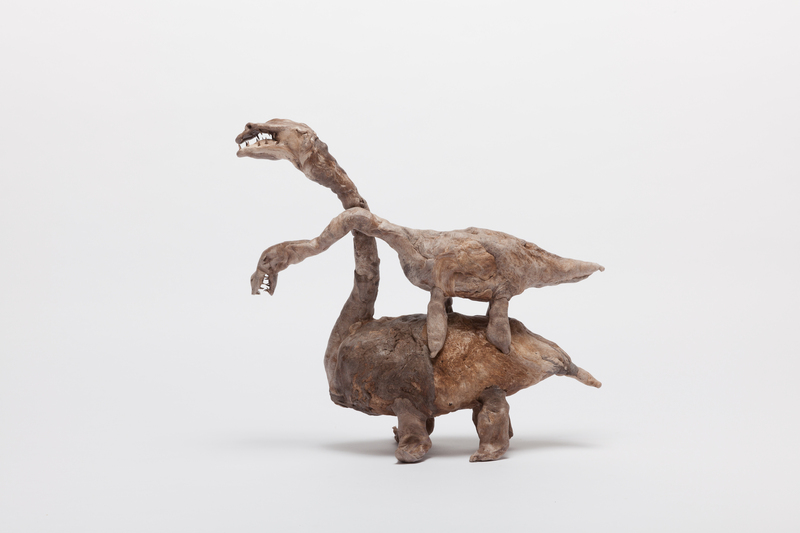 For her Hammer Project, Upritchard will bring together the figures and the dinosaurs for the first time. 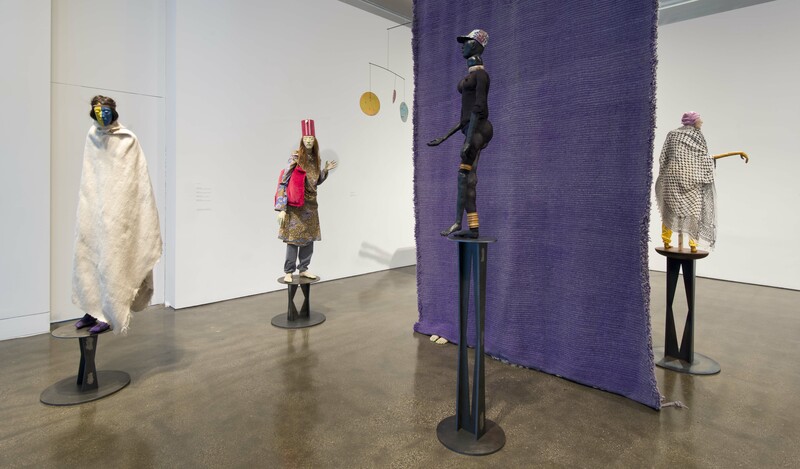 Inhabiting the space like strange bedfellows from different times and places, the characters are not so much actors in a legible narrative or drama as they are complexly enigmatic, strangely absorbed in their own thoughts. 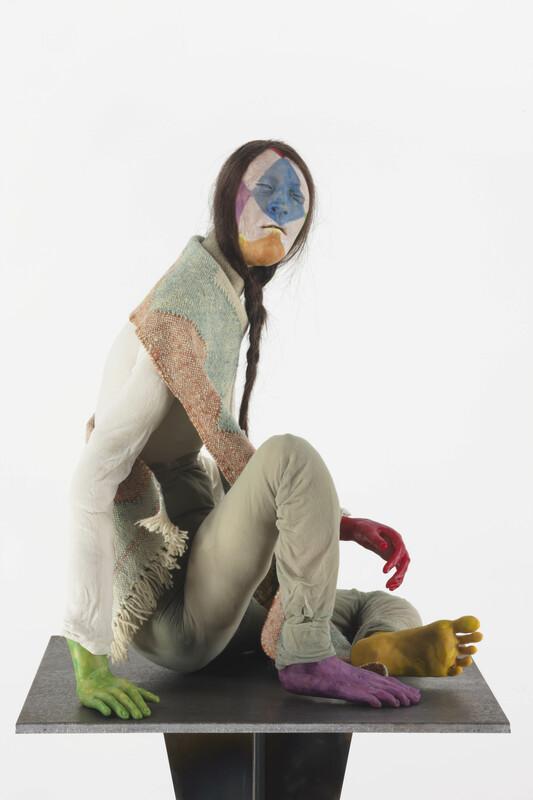 Equally drawn to the history of figurative sculpture as to a wide range of craft and artisan traditions around the world—from ceramic techniques to glass blowing, enameling to welding—Upritchard pushes these practices in new directions, bringing them together to create a striking and original visual language of her own. This will be Upritchard’s first solo exhibition on the west coast. The exhibition is organized by Hammer senior curator Anne Ellegood with MacKenzie Stevens, curatorial assistant. Born in 1976 in New Plymouth, New Zealand, Francis Upritchard graduated from Canterbury University of Fine Arts in New Zealand in 1998. 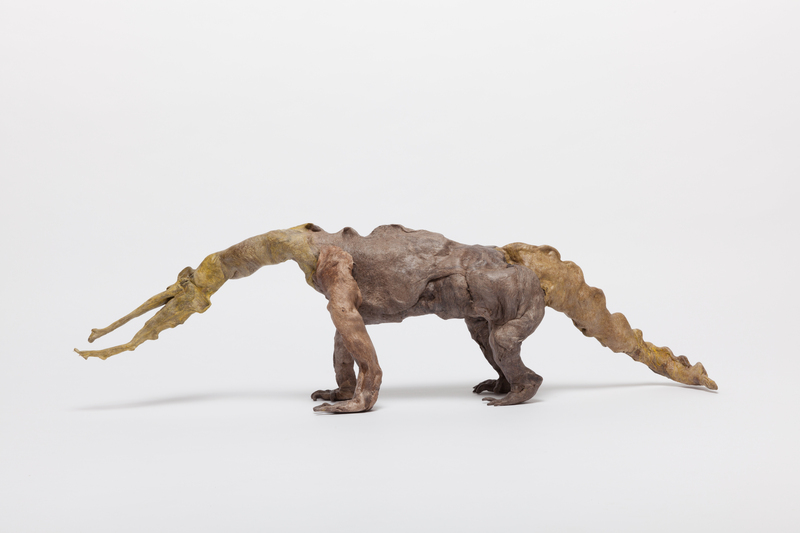 She has recently had solo exhibitions at The Whitechapel and Kate McGarry, London (2014), The Douglas Hyde Gallery in Dublin (2013), Anton Kern Gallery in New York (2013), Nottingham Contemporary (2012), and MIMOCA in Kagawa, Japan (2013) and Secession, Vienna (2011). 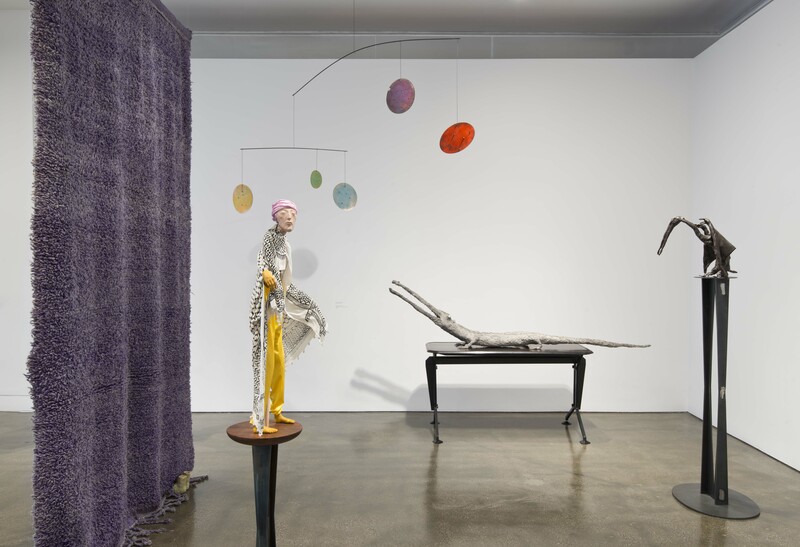 Her only other solo museum exhibition in the United States, A Long Wait, took place in 2012 at the Contemporary Arts Center in Cincinnati. 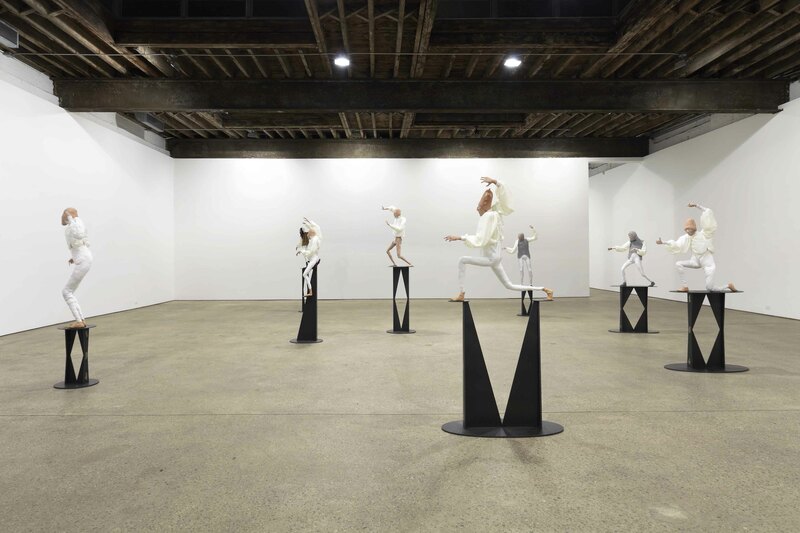 In 2009, she represented New Zealand at the 53rd Venice Bienniale with her exhibition Save Yourself. 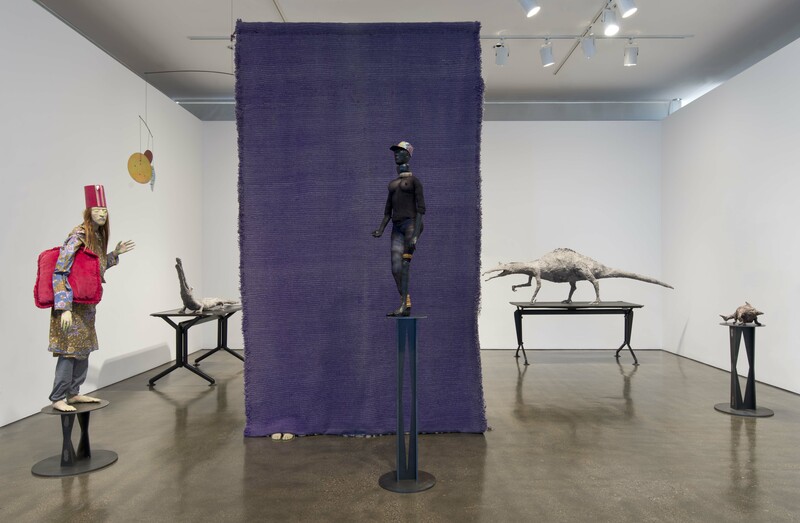 Her work has been included in numerous group exhibitions, including Freedom Farmers at the Auckland City Gallery in New Zealand (2013), Lilliput at the New York High Line (2012), Contact at Frankfurter Kunstverein, Germany (2012) Bush of Ghosts: Nathan Mabry, Djordie Ozbolt and Francis Upritchard at Cherry and Martin in Los Angeles (2012), and many others. Upritchard currently lives and works in London. Ideally, the present will always contribute to the building of the future. And this future is not the future of the cosmos but rather the future of my century, my country, my existence. In the work of Francis Upritchard, time is an anomaly. The past, present, and future are all inscribed in her strange and idiosyncratically alluring figures but not in a neatly linear way so that the references to the past naturally portend the future portrayed. Indeed, there is no sense of a harmonious coexistence of temporalities here. Rather, her cast of characters are from different moments in time—some recognizable archetypes or ethnically specific, others far more ambiguous and amalgamated—and appear gathered together as if by some inexplicable episode. Collectively they form a peculiar band of misfits, as compelling as they are off-putting, as familiar as they are irresistibly eccentric. Despite Upritchard’s deliberately anachronistic combinations of referents, she understands that the present plays a crucial role in the unfolding of the future, just as Fanon asserts in the epigraph to this essay. Fanon proclaims that the future of which he speaks is not a distant place blissfully floating out of reach but rather is always situated in our immediate surroundings and, perhaps most importantly, is imminent. This sense of the future—one that is at once unknowable and surprising and yet so entwined with the past and present as to be remarkably foreseeable, predictably and perpetually pending—is at the core of Upritchard’s endeavor. 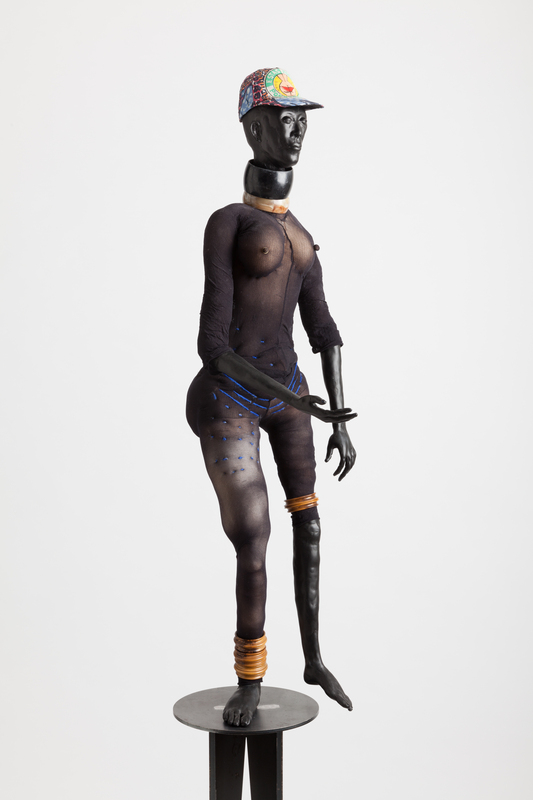 Whatever patina of otherworldliness her figures have acquired, they are distinctly grounded in our daily experiences, in our “existences,” to borrow Fanon’s term. 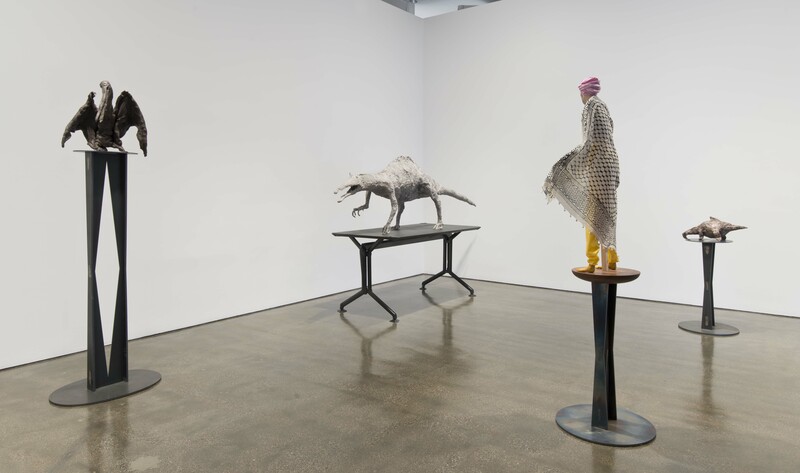 In other words, Upritchard’s figures are mirrors held up, at times more opaque than reflective but nonetheless capable of revealing much about our past, our present, and even our future. 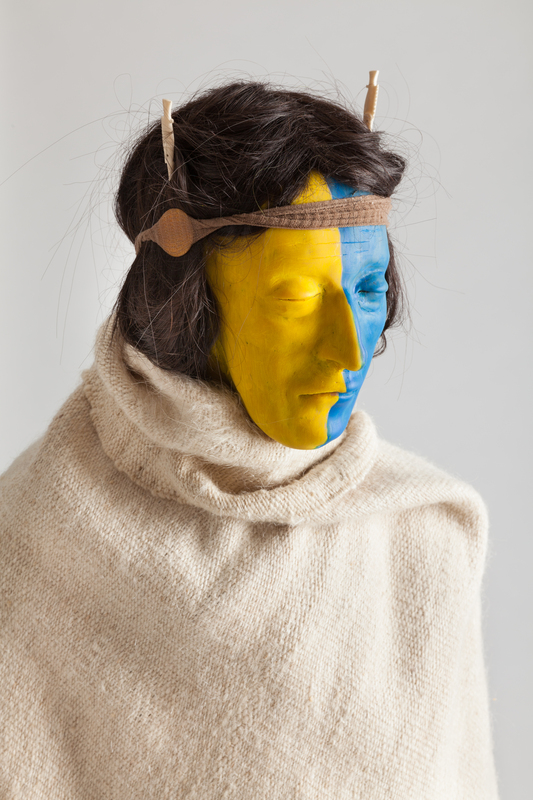 Upritchard has been making figurative sculptures—primarily using wire frames covered with a polymer modeling material that is then baked and painted—since 2006. Some hail from long-ago eras—protagonists of medieval mythology like the knight, the harlequin, the jester—while others are from the more recent past—beatniks, hippies, and other nonconformists. Various figures are identified by their vocation—music teacher, potato seller, psychic—or distilled to a primary, and often less than laudatory, characteristic, such as “liar,” “misanthrope,” “ninny,” or “nincompoop.” Upritchard is drawn to a variety of arts, crafts, and design from around the world produced over the past several centuries, and an array of objects and techniques have informed her work: the fifteenth-century German sculptor Erasmus Grasser’s wooden figures; the Bayeux Tapestry, made in the eleventh century, with its scenes of the Norman conquest of England; the use of canopic jars in Egyptian mummification; the bronze figures of the Chola dynasty in India; and the blank expressions of the masks used in Japanese Noh theater. 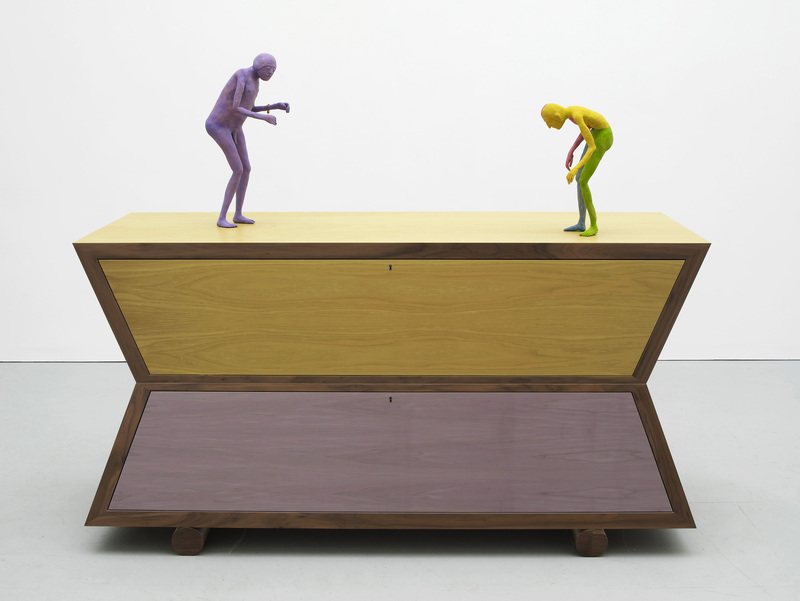 And while visual nods to these precedents serve to root the work in the past, the figures are decidedly contemporary. 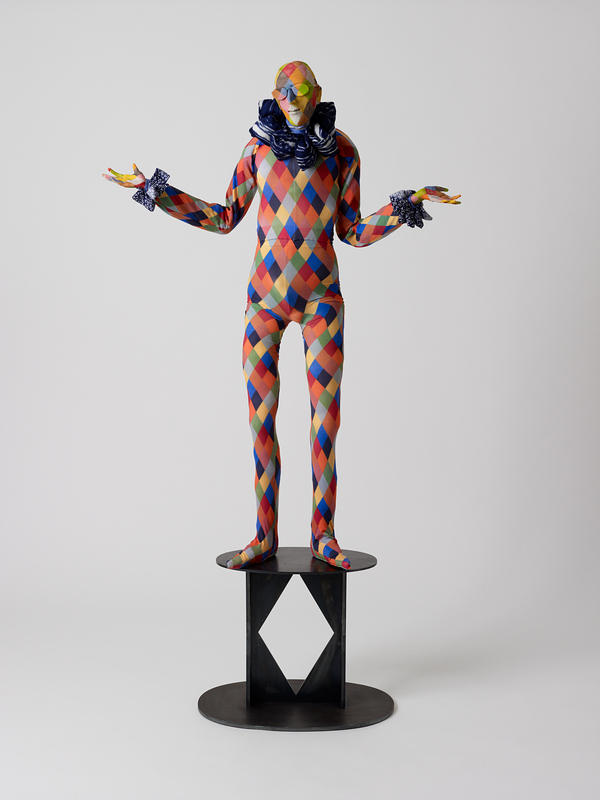 Part of this stems from Upritchard’s flair for saturated colors and embrace of pattern for her figures’ attire—which is often made from unique hand-dyed silks, monochromatic cottons, or vibrant plaid wools—along with the custom steel bases on which her figures are positioned (created in collaboration with her husband, the designer Martino Gamper), which feature bold geometric shapes and clean lines.